Whenever people talk about exploring and going on adventures, they dream up these elaborate plans in exotic destinations that are so far away from them. Often, though, it’s likely that the area around these people has yet to be explored. It’s easy to overlook the destinations that reside in our surroundings, to dismiss them because of their proximity. Realizing this, and being from the Bay Area, I’ve desired to explore the area I live in for a long time now. A few months ago, I wrote about my first attempt in this endeavor. I traveled to Carmel by the Sea, a destination that is only an hour or so from my home. In awe of its beauty, I wondered why I hadn’t done this sooner and felt more convicted in my journey. I live in a place that so many people come to explore – it’s time I did the same. When I write about my explorations this year, I am going to call it “My California”. While January can be cold and rainy here, there is still so much to explore. This month, we decided to do some wine tasting with my sister-in-law, Laurie. 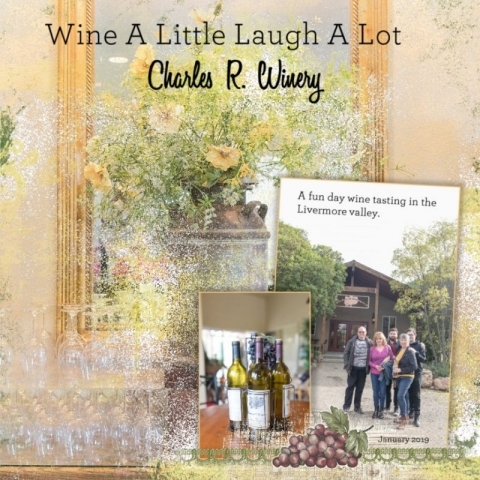 She lives in Livermore, a city in the Bay Area teeming with vineyards – so much so that there are more than fifty wineries in the Livermore area. Laurie works part-time as a “pourer” at Charles R Winery, so she was our tour guide for the day. We started at her winery, Charles R, then made our way to John Evan Cellars, ending with Cedar Mountain. My favorite tasting was the Port Tasting at Cedar Mountain, where we tried six different ports. Our host saved the Tortuga Royale for last, a port they described as a chocolate lover’s heaven. We had a great time hanging out with family and taking the opportunity to explore more of the area we live in. I love this blog! A reminder to slow down and enjoy life – no matter where we are! I am going to take my husband, who loves port, to check out Cedar Mountain. Livermore is not too far from home. What a fantastic idea! I live just an hour from NYC, yet rarely enjoy any offerings. I think it’s time to change that! Thank you for the inspiration. Great reminder! Beautiful page! Enjoy Your California! Beautiful page to go with some great memories, Kim. And you were in ‘my’ town! Livermore is a great city to live in. Livermore is beautiful! We will have to meet up someday!